Vicious. 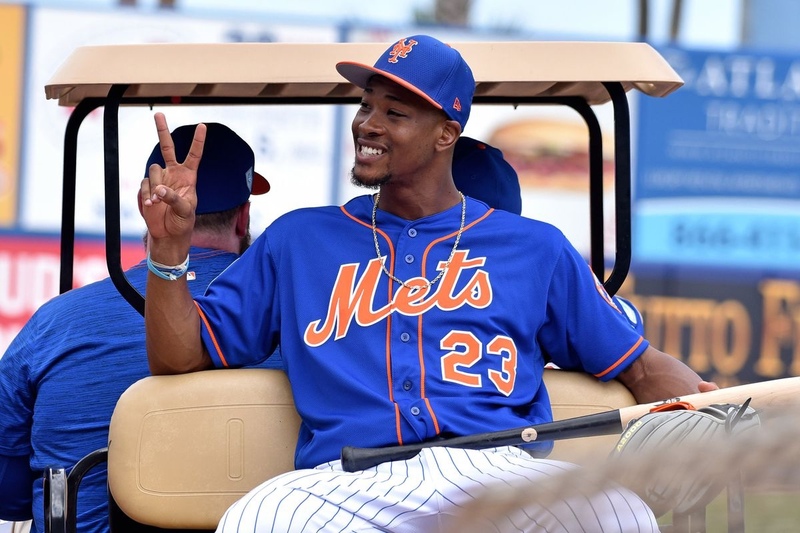 That’s hardly a word anyone would use when it comes to the terms of speed, but thinking of newly acquired Mets OF Keon Broxton, the word vicious perfectly describes the youngster’s approach on the base paths. He’s already stolen two bases in his first three games wearing a Mets uniform. What I find encouraging is that he stole those bases with the Mets losing, situational base stealing, just like the hitting approach Chili Davis is implementing on the team in the batters box. First drafted by the Phillies in the 29th round in the 2008 MLB June Amateur Draft out of Lakeland Senior HS, Broxton opted to go to a Community College in Gainesville, Florida. The move paid off as he was drafted in the third round by the Arizona Diamondbacks just one year later. After being traded to the Pirates organization, Broxton eventually found himself in the Milwaukee Brewers system. Throughout his Minor League career, Broxton has 10 seasons under his belt. He has a slash line of .256/ .335/ .419/ .754 and stole 201 bases over that time. Broxton debut in 2015 for the Pirates appearing in seven games but really broke out in 2017 when he had a 20/20 season with 49 R.B.I.’s in 414 at-bats. His slash line was .220/ .299/ .420/ .719 in his 463 plate appearances. The Mets traded off reliever Bobby Wahl and two minor leaguers for the speedy outfielder. It looks like it may have been the right way to go. I love Broxton, I loved getting the guy in the trade. Broxton has major talent, with some flaws he can improve. First off, the defense is out of this world. He has amazing numbers to back that up. He had a ridicoulus 11 defensive runs saved in 91.1 innings. It led to a 1.6 Bwar (higher than Harper) in just 51 games. Well, we have Lagares who is great on defense, Broxton also provides an on base skill and some pop. In a full season in 2017, Broxton hit 20 homeruns and beside hitting just .221 in his career, he owns a .313 OBP. Not great but higher than Lagares (.300). Broxton also has stolen base skills, which Lagares doesn’t really provide. Broxton has a 79% succes rate stealing bases and is two for two so far this year. Yes Broxton has trouble making contact as that is his major flaw. But if he is able to hit .220 with some pop and obp around .320 he is very valuable with his defense. For the record I like Lagares, but to me Broxton is arguably equal defensively with more potential with the bat. Previous New York Mets or Flushing Zoo?